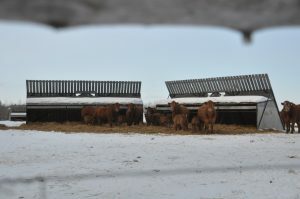 The sustainable future of Quebec cattle farms depends on eco-responsible practices. Quebec cattle producers fully adhere to the definition of sustainable development. This refers to actions and decisions that are, at the same time, ecologically sustainable, economically profitable and socially acceptable. The actions taken by producers reflect all these criteria without favouring one over the others. Cattle production reconciles the three sustainable development parameters particularly well and is a real bulwark against the decline of biodiversity. Cattle producers thus act as guardians of the rural heritage in occupying and shaping the Quebec countryside. Watch this video: What beef producers need to know about environmental footprint? Transmitting information to producers on best practices. Promoting innovative practices on the farm. The main priority adopted for the cattle sector concerns manure management in relation to watercourse protection. Producers prefer an approach that reflects overall manure management efficiency (storage, transportation and spreading) and have opted for solid manure management and storage in fields. Producers, through the PBQ and in partnership with MAPAQ and the ministère du Développement durable, de l’Environnement et de la Lutte contre les changements climatiques (MDDELCC), have been proactive by conducting several research projects on field stockpiling. These projects have confirmed the agri-environmental effectiveness of this technique and have led to the drafting of the Guide de conception des amas de fumier au champ (Design Guide for Field Stockpiling of Manure) that guides the creation and management of solid manure stored temporarily in fields, a technique widely used by fed cattle and cow-calf producers. Approximately 225 people attended the training sessions offered by the PBQ on the field stockpiling technique in 2010 and 2011. The Agricultural Operations Regulation (REA), which came into effect on August 5th, 2010 enables all agricultural operations, regardless of the type of production, number of animals and location of the farm, to stockpile solid manure in a cultivated field. 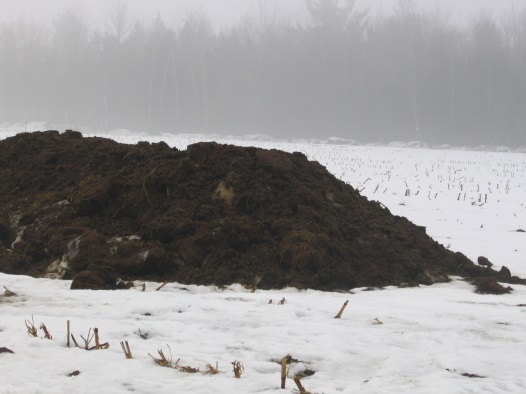 Producers who use field stockpiling of manure must comply with the conditions stipulated in the REA and must seek the advice of an agronomist in the creation and management of the piles. What is a field stockpile? The temporary field stockpiling of manure technique consists of placing, at a given frequency, animal excrements in a solid form (manure) in a pile in cultivated fields while waiting for the appropriate time for spreading. Manure is collected during the cleaning of buildings or wintering pens where animals are housed. Manure is transported with a tractor and a spreader, a dump bucket or a truck. At the appropriate time, the producer then removes the manure with a tractor bucket or a hydraulic bucket to spread it in the field, according to the operation’s agri-environmental fertilization plan. 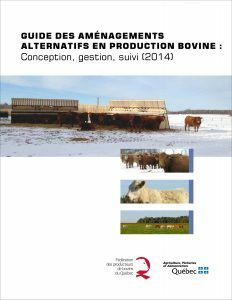 The Guide pour les aménagements alternatifs en production bovine : conception, gestion, suivis de boucherie, jointly drafted in 2014 by the PBQ and MAPAQ, describes the wintering pens technique and defines the management of manure produced by animals housed in them. The content of this guide was developed based on research projects on the subject and the knowledge of many professionals from the sector. Since 2014, 376 people have attended the training session Successfully Managing a Wintering Pen: My Role as an Agricultural Producer. What is a wintering pen? A wintering pen is part of a facility that houses animals outside during the winter period. This type of facility has, among other things, a service building, rearing areas, a feeding area, windbreaks to protect the animals, calf shelters and a vegetative filter strip to capture contaminated water.